The National Baseball Hall of Fame and Museum, tucked away in upstate New York in a small town called Cooperstown, is far from any major media market or big league stadium. Yet no sports hall of fame’s membership is so hallowed, nor its qualifications so debated, nor its voting process so dissected. Since its founding in 1936, the Hall of Fame’s standards for election have been nebulous, and its selection processes arcane, resulting in confusion among voters, not to mention mistakes in who has been recognized and who has been bypassed. Numerous so-called “greats” have been inducted despite having not been so great, while popular but controversial players such as all-time home run leader Barry Bonds and all-time hits leader Pete Rose are on the outside looking in. Now, in The Cooperstown Casebook, Jay Jaffe shows us how to use his revolutionary ranking system to ensure the right players are recognized. The foundation of Jaffe’s approach is his JAWS system, an acronym for the Jaffe WAR Score, which he developed over a decade ago. Through JAWS, each candidate can be objectively compared on the basis of career and peak value to the players at his position who are already in the Hall of Fame. Because of its utility, JAWS has gained an increasing amount of exposure in recent years. Through his analysis, Jaffe shows why the Hall of Fame still matters and how it can remain relevant in the 21st century. WHY CARE ABOUT THE HALL OF FAME? JAY JAFFE is a contributing baseball writer for SI.com. He is the founder of the Futility Infielder website, one of the oldest baseball blogs, and from 2005-2012 was a columnist for Baseball Prospectus. He has been a recurring guest on MLB Network’s MLB Now and Clubhouse Confidential shows and a member of the Baseball Writers Association of America since 2011. He lives in Brooklyn. 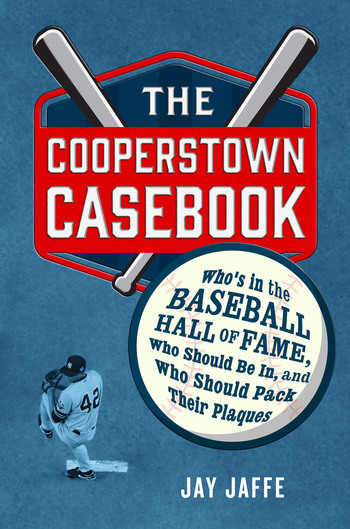 The Cooperstown Casebook is his first book.